Appliances/Gadgets control through SMS using microcontroller is a final year project for electronics students. This ECE project provides the facility to control all home appliances/gadgets like TV, Fans, Washing machines, refrigerator, bulbs and more with the use of mobile phone’s SMS feature. You can remotely control all the gadgets via SMS. Handle all the appliances from within the home or outside. 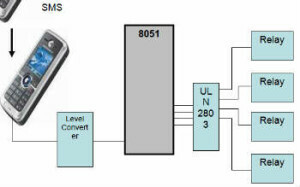 All facilities are possible by the use of microcontroller 8051 device. Here we provide the latest technology to deal with this project for the better performance. No need of the physical presence in the home and control all gadgets via SMS texting. People no need to remember whether a particular device is ON/OFF. This project is specially designed for final year ECE students. Engineering and Diploma/polytechnic electronics students can use this as a mini project for their academics.